Little Marie is unable to walk, but she is full of gratitude. 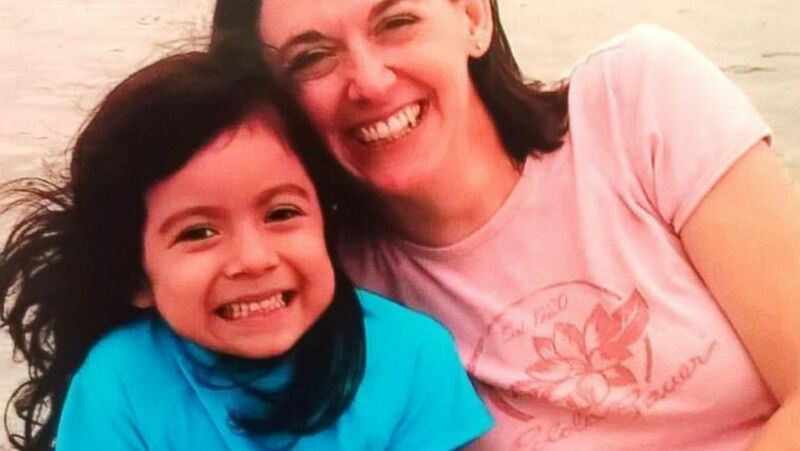 camera (Michele Suprenant/Children’s Healthcare of Atlanta) 8-year-old Marie Suprenant, seen here with her adopted mother Michele, wrote an open letter to the social workers who helped her after she was abused as an infant. Eight-year-old Marie Surprenant was abused as an infant. She can't walk as a result of the injuries she sustained. And yet, she is grateful. In an open letter to "social workers and detectives," the little girl writes that she was taken to the hospital as a baby where, "he lied and said I fell out of the bed. So that's when you got involved and solved my case and not letting the bad guys hurting me or anyone else." Now, because of their help, she writes she is "happy" and in a "warm and safe environment." Her mother, Michele Surprenant, who is herself a social worker, adopted Marie from foster care as soon as she was released from the hospital. "I was explaining to Marie that often social workers get a bad rap, many people are afraid of social workers, think they are the people who take babies away," Surprenant said. "But most are good people trying to change the world." 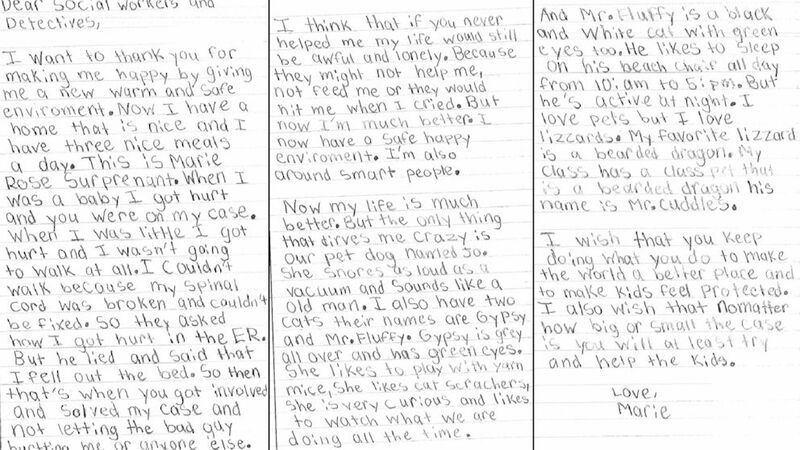 Marie's letter was originally featured on Children's Healthcare of Atlanta's blog. It has become one of their top-read posts of all time. (Michele Suprenant/Children’s Healthcare of Atlanta) 8-year-old Marie Suprenant wrote an open letter to the social workers who helped her after she was abused as an infant. The content of the thank-you letter, Surprenant said, was all Marie. Which makes sense because a portion of the note, after the thank-yous have been expressed, is about her dog, who drives her "crazy" because of the snoring that is "as loud as a vacuum and sounds like an old man." It also talks about her two cats and her class pet, a bearded lizard. "She has a very sweet personality and is very matter-of-fact," said Surprenant. She's also very grateful, her mother said. "She was hurt when she was so small and she's never walked," Surprenant added. The hardest part, her mom said, is that her paralysis causes scoliosis, so she needs rods in her back and surgery every six months. "Two surgeries ago, she asked if she had to have them because of the man who hurt her," she said. "That was hard." Though Marie used to speak regularly about the "man who hurt" her, today she rarely mentions him, Surprenant said. The lesson, Surprenant added, is that "you can move on. Anybody can have a tragedy, but you work through it and life can be beautiful. She is a happy kid. People assume because she has a physical disability she will be unhappy or maybe she has a hard time making friends. Nothing could be further from the truth." But despite her gratitude, Marie's planning on leaving the social work to her mom. She wants to be an orthopedic surgeon. "Every time she sees her orthopedic surgeon, she's asking him career planning questions," Surprenant said. "But I told her sometimes he has to be at work at 6 a.m. some days, and she thinks that's a little too early. She's wondering if she'll be able to work the night shift."